When a Microsoft Exchange mailbox account is configured by a user in MS Outlook, an OST file is automatically created with the extension .ost. This .ost file is popularly known as Offline folder and it allows user to access the exchanged emails even when the network connection with the server is down or unavailable. At times, when the network connection switches from being unavailable to accessible, the server may not be able to sync all the emails in the .ost file which in turn obstructs important mailing functions like sending and receiving of messages, deletion of mails etc. In other words, synchronization issues may arise that can lead to sudden crash of the Microsoft Outlook application or may also cause it to hang or slowdown to a considerable extent. Right click the folder that needs to be verified and go to Properties. In the Properties window, search for the synchronization tab and click it. If you don’t find the synchronization tab, chances are that you might not have set up your profile to use offline folders. Under the “Statistics” of the folder, verify the “Last Synchronized” field that displays the date and check the number of items that the server folder and the offline folder possesses. If the synchronization is working properly, you will figure out that the number of items in both the server folder and the offline folder will be same. If the synchronization is not working properly, it means that you have some problem in profile settings. The OST Integrity Check tool is an inbuilt tool that runs only on the .ost files. This functionality can quickly eliminate all synchronization problems by recovering the lost information after scanning the .ost file on your system and comparing mailbox items/folders via the scan log which resides in the “Deleted Items” folder. If you’re having Outlook 2003 or Outlook 2007 running in your system, you need to use the OST Integrity Check tool – Scanost.exe file to verify whether your .OST file has synchronization problems. If you have Outlook 2010 or other latest MS Outlook version installed in your system, you may not find the OST Integrity Check tool. If a particular folder has synchronization issues, you just need to synchronize that folder again in the Microsoft Outlook application that you’re running. For doing this, simply right click on the folder and go to Properties. And after that, click Clear Offline Items and click ok. Look out for the Send/Receive tab in the Outlook 2010 ribbon and click it. Next, click Update folder option. Another alternative to resolve synchronization is to reconstruct your .ost file right from the scratch. For this, you will need to delete the existing .ost file. Next, prompt Outlook to download the information again from the Exchange Server for offline usage. Recently, one of our esteemed clients asked our team of technical experts that when he was trying to execute OST file synchronization in Microsoft Outlook, he got an error message with the details – “The operation failed due to a registry/installation problem”. Within no time, our executives recommended to download the trial version of the software Kernel for OST to PST tool. The software utility not only helped the client regain their lost data but also helped them in extracting information from damaged/corrupt databases without disturbing the hierarchy of mailboxes and integrity of data. 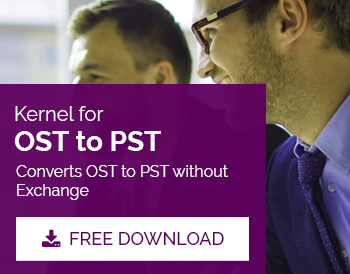 If you’re also looking to restore your precious business emails that have been lost due to any reason, you can purchase the fully licensed version of Kernel for OST to PST tool. This tool also offers its users to try it for a limited period of time without any charges.